Wave information is crucial for people working at sea, to be able to navigate and operate safely. A new product based on satellite altimeter data detailing ‘Significant Wave Height' now enables this. High waves are not only dangerous but can threaten delicate procedures at sea, so wave information is paramount for operating safely and efficiently. For instance, in oil and gas offshore platform operations, historic data and forecasts of wave heights are vital for the safety of personnel, equipment and the environment. In physical oceanography, the Significant Wave Height (SWH) is defined traditionally as the mean wave height (trough to crest) of the highest third of the waves. This mathematical definition of ocean wave height is intended to express the height that would be estimated by a trained observer, capturing the most significant waves over the water surface. Satellite wave measurements come from two main sources: altimetry and Synthetic Aperture Radar (SAR). The SWH can be obtained through altimetry and directional and spectral information with SAR. The Copernicus Marine Environment Monitoring Service (CMEMS) released the first real-time global wave product based on satellite data, broadening its offer—previously based on numerical wave forecast models. Released in the summer of 2017, this new product from satellite altimeter data contains the Significant Wave Height from Jason-3 and from the Copernicus Sentinel-3A satellite altimeter data, provided within three hours after data acquisition. In-situ wave data, typically provided by buoys, are very helpful to validate satellite wave products but in many areas of open water such buoys are not available, because of the difficulty and costliness of installation and maintenance. It provides quality-filtered and inter-calibrated along-track high-resolution SWH (one measurement every 07 km, or every second). 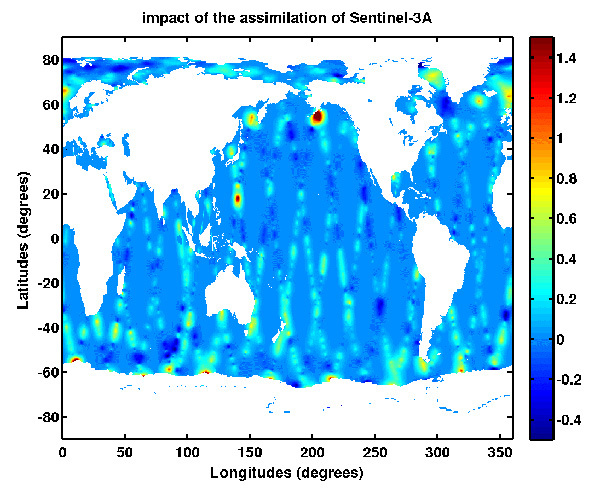 These measurements contribute to global ocean coverage along the satellite ground tracks with 07 km resolution. Such satellite wave products represent actual measurements of the waves, covering the entire Earth, regularly and homogeneously over several years. They often offer a better portrayal of extreme events, which numerical models tend to under estimate. Sentinel-3A wave data assimilation in the CMEMS global wave forecast model has a strong impact in the north-west of the Pacific Ocean related to the typhoon season and in the Gulf of Mexico after Hurricane Harvey. Analysis increment (in metres) of Significant Wave Height (SWH) after 1-day of assimilation of Sentinel-3A wave data in the CMEMS Global Wave Model MFWAM (starting date on 29 August, 2017 at 06:00 UTC to 30 August, 2017 at 0:00 UTC). Sentinel-3A's wave data are also assimilated into numerical real-time wave models to provide wave forecasts with better accuracy. For example, assimilation into the CMEMS global wave forecast model has a strong impact in the north-west of the Pacific Ocean related to the typhoon season and in the Gulf of Mexico after Hurricane Harvey (see figure). Dr Romain Husson, responsible for wave products at CLS for CMEMS, says, "In the first quarter of 2018, CMEMS will also deliver wave products derived from Sentinel-1A and -1B's SAR instrument. 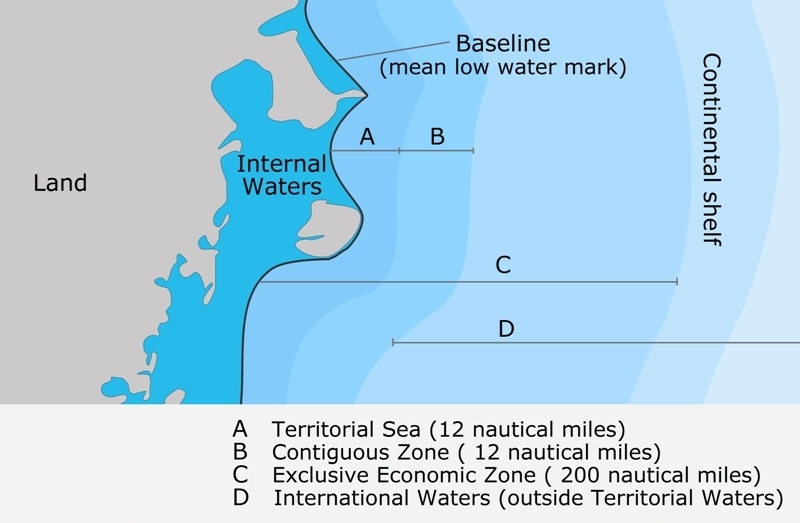 With respect to altimetry, SAR has the unique ability to measure the wave period and direction on top of the SWH and is particularly well suited for long waves, sometimes also referred to as swell." This visualisation shows ocean colour in the north Atlantic and along the Iberian coast, caused by Chlorophyll activity from January - July 2017. Audio commentary is provided by EUMETSAT's remote sensing scientist, Ewa Kwiatkowska. 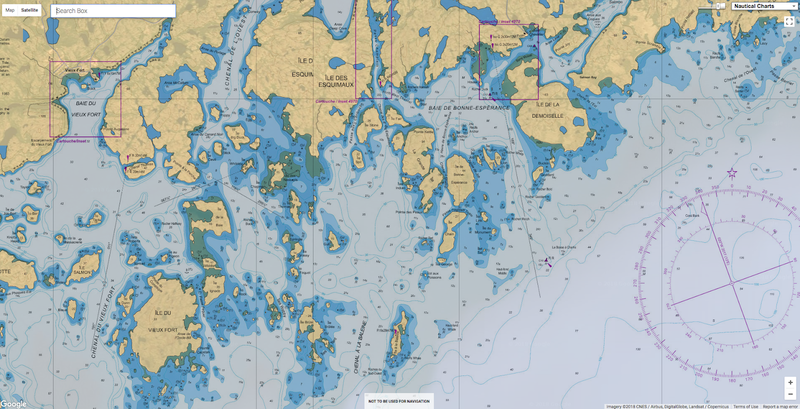 This data is freely available from the EU’s Copernicus Marine Environment Monitoring Service (CMEMS), operated by Mercator Ocean. In partnership with EU Member States, the European Commission leads and coordinates this programme, to improve the management of the environment, safeguarding lives every day. ESA is in charge of the space component, responsible for developing the family of Copernicus Sentinel satellites and ensuring the flow of data for the Copernicus services, while the operations of the Sentinels have been entrusted to ESA and EUMETSAT. By 2025, more than half of the world’s population will be living in water-stressed areas. But scientists struggle to collect and analyze even the most fundamental data about the real-time conditions of our oceans, lakes and rivers. There are specialized sensors that can be deployed to detect specific chemicals and conditions in water, but they miss unanticipated ones, like invasive species or the introduction of new chemicals from run off. Plankton, however, are natural, biological sensors of aquatic health. Even slight changes in water quality affect their behavior. They also form the foundation of the oceanic food chain, which serves as the primary source of protein for more than a billion people. Yet very little is known about how plankton behave in their natural habitat, because studying them typically requires collecting samples and shipping them to a laboratory. Small autonomous AI microscopes, networked in the cloud and deployed around the world, will continually monitor in real time the health of one of Earth's most important and threatened resources: water. IBM’s mission is to help their clients change the way the world works. There’s no better example of that than IBM Research’s annual “5 in 5” technology predictions. Each year, we showcase some of the biggest breakthroughs coming out of IBM Research’s global labs – five technologies that they believe will fundamentally reshape business and society in the next five years. This innovation is informed by research taking place at IBM Labs, leading edge work taking place with our clients, and trends we see in the tech/business landscape. Later today, they’ll introduce the scientists behind this year’s 5 in 5 at a Science Slam held at the site of IBM’s biggest client event of the year: Think 2018 in Las Vegas. Watch it live or catch the replay here. Science Slams give their researchers the opportunity to convey the importance of their work to a general audience in a very short span of time — approximately 5 minutes. they have found this to be an extremely useful exercise that makes our innovation more accessible by distilling it down to its core essentials. Here’s a summary of the two of the five predictions IBM scientists will present this year. The microscope has no lens and relies on an imager chip, like the one in any cell phone, to capture the shadow of the plankton as it swims over the chip, generating a digital sample of its health, without the need for focusing. AI-powered robot microscopes may save them. In five years, small, autonomous AI microscopes, networked in the cloud and deployed around the world, will continually monitor in real time the health of one of Earth’s most important and threatened resources: water. IBM scientists are working on an approach that uses plankton, which are natural, biological sensors of aquatic health. AI microscopes can be placed in bodies of water to track plankton movement in 3D, in their natural environment, and use this information to predict their behavior and health. This could help in situations like oil spills and runoff from land-based pollution sources, and to predict threats such as red tides. But only the unbiased AI will survive. Within five years, we will have new solutions to counter a substantial increase in the number of biased AI systems and algorithms. As we work to develop AI systems we can trust, it’s critical to develop and train these systems with data that is fair, interpretable and free of racial, gender, or ideological biases. With this goal in mind, IBM researchers developed a method to reduce the bias that may be present in a training dataset, such that any AI algorithm that later learns from that dataset will perpetuate as little inequity as possible. IBM scientists also devised a way to test AI systems even when the training data is not available. "Hold your breath," says inventor Tom Zimmerman. "This is the world without plankton." These tiny organisms produce two-thirds of our planet's oxygen -- without them, life as we know it wouldn't exist. In this talk and tech demo, Zimmerman and cell engineer Simone Bianco hook up a 3D microscope to a drop of water and take you scuba diving with plankton. Learn more about these mesmerizing creatures and get inspired to protect them against ongoing threats from climate change. In five years, small autonomous AI microscopes, networked in the cloud and deployed around the world, will continually monitor the condition of the natural resource most critical to our survival: water. There are specialized sensors that can be deployed to detect specific chemicals and conditions in water, but they miss unanticipated ones, like invasive species or the introduction of new chemicals from run off. Plankton, however, are natural, biological sensors of aquatic health. IBM researchers are building small, autonomous microscopes that can be placed in bodies of water to monitor plankton in situ, identifying different species and tracking their movement in three dimensions. The findings can be used to better understand their behavior, such as how they respond to changes to their environment caused by everything from temperature to oil spills to run off. They could even be used to predict threats to our water supply, like red tides. The microscope has no lens and relies on an imager chip, like the one in any cell phone, to capture the shadow of the plankton as it swims over the chip, generating a digital sample of its health, without the need for focusing. In the future, the microscope could be outfitted with high performance, low power AI technology to analyze and interpret the data locally, reporting any abnormalities in real-time so they can be acted upon immediately. Because what’s good for plankton is good for all of us. Within five years, the number of biased AI systems and algorithms will increase, much like the increase of computer viruses in the early aughts. But we will deal with them accordingly –coming up with new solutions to control bias in AI and champion AI systems free of it. AI systems are only as good as the data we put into them. Bad data can contain implicit racial, gender, or ideological biases. Many AI systems will continue to be trained using bad data, making this an ongoing problem. that will tackle bias will be the most successful. The number of biased AI systems and algorithms will dramatically increase, but we will come up with new solutions to control bias and champion AI systems free of it. We may even improve ourselves in the process. The MIT-IBM Watson AI Lab’s efforts on shared prosperity are drawing on recent advances in AI and computational cognitive modeling, such as contractual approaches to ethics, to describe principles that people use in decision-making and determine how human minds apply them. The goal is to build machines that apply certain human values and principles in decision-making. A crucial principle, for both humans and machines, is to avoid bias and therefore prevent discrimination. Bias in AI system mainly occurs in the data or in the algorithmic model. As we work to develop AI systems we can trust, it’s critical to develop and train these systems with data that is unbiased and to develop algorithms that can be easily explained. To this aim, IBM researchers developed a methodology to reduce the bias that may be present in a training dataset, such that any AI algorithm that later learns from that dataset will perpetuate as little inequity as possible. IBM scientists also devised a methodology to test AI systems even when the training data is not available. This research proposes that an independent bias rating system can determine the fairness of an AI system. For example, the AI service could be unbiased and able to compensate for data bias (the ideal scenario), or it could be just following the bias properties of its training (which could be solved by data de-biasing techniques), or it could even introduce bias whether the data is fair or not (the worst scenario). The AI end-user will be able to determine the trustworthiness of each system, based on its level of bias. Identifying and mitigating bias in AI systems is essential to building trust between humans and machines that learn. As AI systems find, understand, and point out human inconsistencies in decision making, they could also reveal ways in which we are partial, parochial, and cognitively biased, leading us to adopt more impartial or egalitarian views. In the process of recognizing our bias and teaching machines about our common values, we may improve more than AI. We might just improve ourselves. In 1971 Jacques Cousteau, a French oceanographer, called for a shift in how humans see the oceans. “We must plant the sea and herd its animals…using the sea as farmers instead of hunters,” he said. Cousteau's call fell largely on deaf ears at the time. The environmental movement was only just beginning and humans were still dealing with the sea as they always had: as hunters, who took from it what they wanted and dumped into it what they did not want. In the past decade, however, two important developments have changed that. First, with growing environmental awareness it has become clear that the hunter-gatherer relationship cannot continue. 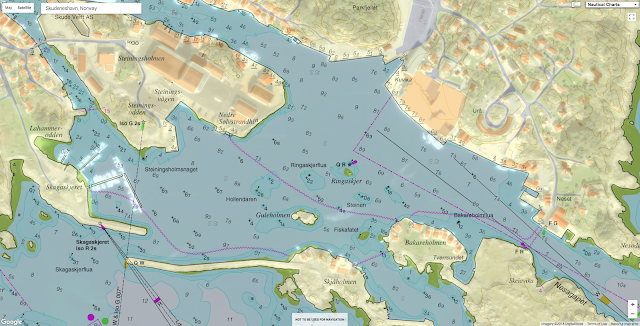 And second, technology is making it possible to interact with the sea in a different way. Underwater drones are now able to get to previously unexplorable places, such as underneath glaciers in Antarctica, to assess the impact of global warming. New forms of unmanned, robotic boats have been developed to sail the seas gathering data on ocean temperature, pollutants, carbon-dioxide and oxygen concentrations. It will be possible to transfer all of this data instantly back to shore from anywhere on the ocean using newly built internet infrastructure, and there are already markets for such data among weather forecasters, fisheries managers, and oil and gas companies. 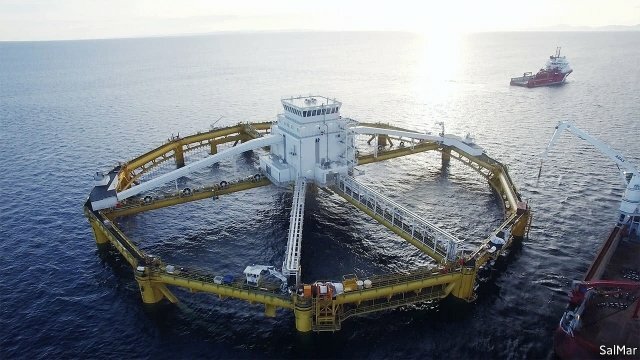 New open-ocean fish farms with automatic feeders (pictured) enable more fish to be farmed in deeper waters—a way to ease the crisis of overfishing. There are even military implications, with improved undersea surveillance making it harder for submarines to hide, thus denting their second-strike capabilities. 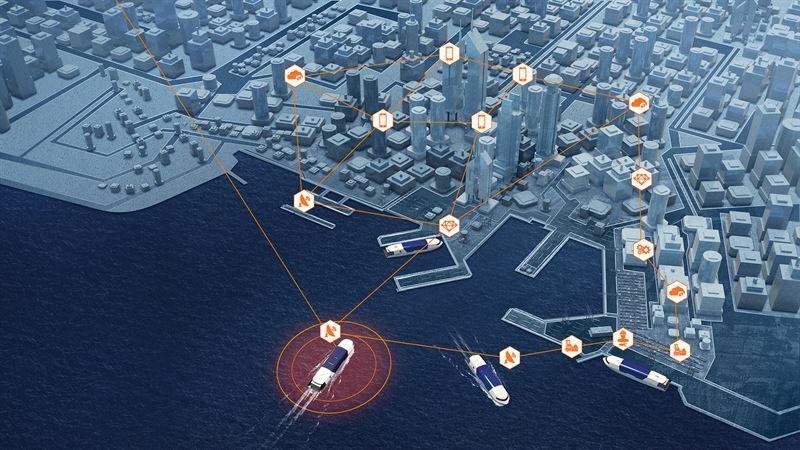 Connecting smart ships with smart ports to deliver fundamental benefits to the marine sector. At the root of the change is the ability to produce smaller, cheaper electronic components that use less power. The smartphone boom has kickstarted progress in drones, robotics and small satellites that are already being as transformative in the sea as in the skies and in space. All of this reduces the number of people involved and does away with the expense of keeping people alive on or under the sea. So it vastly expands the volume of the ocean that can be monitored and measured, whether for fishery management or weather forecasting. Lithium-ion batteries allow underwater drones to travel for up to 60 hours on one charge, giving them a range of about 400km. Harvesters with pressure-resistant electronic innards will soon be used to gather ore from seabeds that were previously inaccessible. This in turn could reduce the amount of destructive mining that takes place on land. Humans have not shown much restraint in the past with new technologies that enable faster or easier extraction of resources. So it will be crucial to regulate people’s ability to use the new technology, as well as regulating to reduce the risks already being taken. 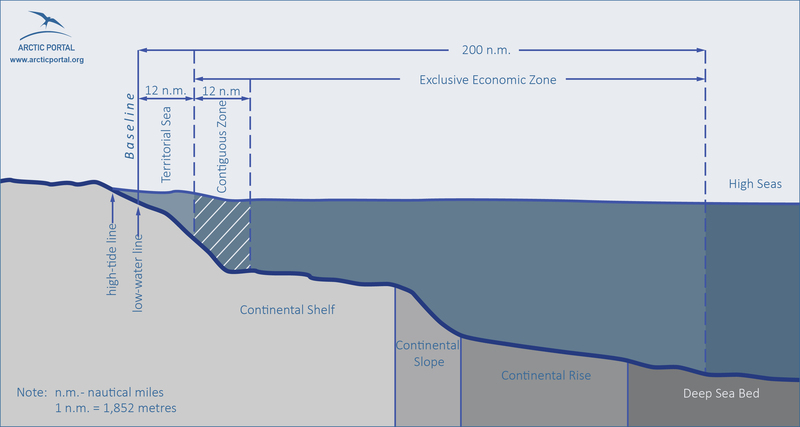 The International Seabed Authority, for instance, is overseeing the new system to authorize mining the deep ocean floor, and is expected to approve by 2019 the first attempt to do so off the west coast of Mexico. If such systems can be put in place, the potential for transforming human interaction with the oceans is very real, to the benefit of human beings and the oceans themselves. Data may encapsulate the events of a single second or many years; it may span a small patch of Earth or entire systems of suns and planets. Visualizing data within its natural environment maximizes the potential for learning and discovery. Scientific visualization can clarify data’s relationships in time and space. In this visualization, the issue of the declining sea ice near the North Pole is set in its natural configuration. The visualization begins by showing the dynamic beauty of the Arctic sea ice as it responds to winds and ocean currents. Research into the behavior of the Arctic sea ice for the last 30 years has led to a deeper understanding of how this ice survives from year to year. In the animation that follows, age of the sea ice is visible, showing the younger ice in darker shades of blue and the oldest ice in brighter white. An analysis of the age of the Arctic sea ice indicates that it traditionally became older while circulating in the Beaufort Sea north of Alaska and was then primarily lost in the warmer regions along the eastern coast of Greenland. 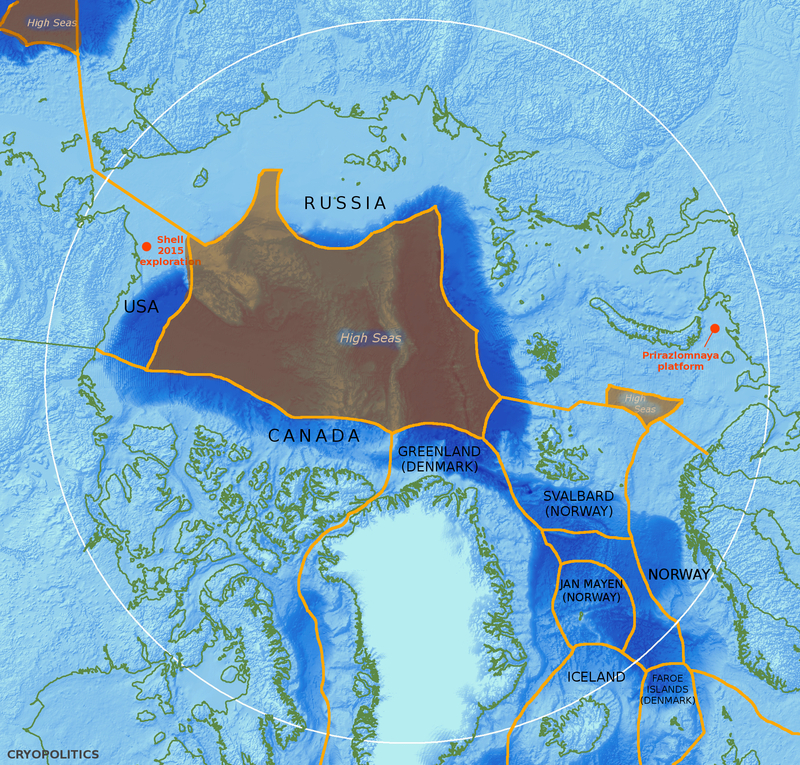 In recent years, however, warmer water in the Beaufort Sea, possibly from the Bering Strait, often melts away the sea ice in the summer before it can get older. This visual representation of the ice age clearly shows how the quantity of older and thicker ice has changed between 1984 and 2016.